Each piece of country decor wood furniture that's featured here is an heirloom quality work of art. Our master craftsmen pour their time, love and energy into building the finest and sturdiest made in America country furniture available today. 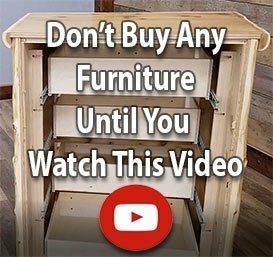 Shop Woodland Creek's if you want high quality rustic furniture that's built to last ... and helps you build lasting memories for generations to come! Why stop at a cedar dresser when you can also get a 4-drawer deacon's bench or a sitting chest? Cedar log dressers so versatile, blending right into contemporary and rustic decor settings. Their light tone compliments everything from cool cottage furniture to warm southwestern decor color palettes. After picking up an extra gnarly Cedar Lake Logger dresser or a smooth-milled Cedar Lake chest of drawers, check out our other reclaimed wood furniture options in aromatic cedar.